All things considered, the Song Sparrow must rank among the most common and frequently seen native sparrows in the USA, though it undoubtedly goes unnoticed – or, at least, unrecognized – by the vast majority of Americans. This heavily streaked, medium-sized sparrow occupies much of North America at least part of the year, and during the breeding and nesting seasons in particular lives boldly up to its name. It’s a frequent visitor to feeders, too, so a bird easy to get to know. The Song Sparrow’s mellifluous voice, like its genetic character, doesn’t vary much across the species’ extensive distribution, but its physical appearance does: An Aleutian Song Sparrow from Alaska can appear to an untrained eye like a different sparrow species than a Song Sparrow from the East or coastal California. Song Sparrows range between about five and seven inches long, with a wingspan of seven to 9.5 inches. They weigh roughly from half an ounce to 2 ounces. These parameters suggest the geographic variation within the species: The aforementioned Aleutian form grows significantly larger than the other Song Sparrows, and the California Coast form a bit smaller. The body mass of the species varies by 150% across its geographic range, according to the Cornell Lab of Ornithology’s Birds of North America. The Song Sparrow’s salient physical features include its round head, heavy and stubby bill, and relatively long, rounded tail. Head, back, wings, and breast come streaked; the breast markings often merge to a prominent blotch. Thick dark stripes edge the sparrow’s white or pale throat. Males and females don’t exhibit markedly different plumage – Song Sparrows are monomorphic, in other words – though males tend to be bigger. In flight, Song Sparrows show off the broadness of their round-tipped wings and typically pump their tails. Comparing the Song Sparrow to the similar-looking and even more widespread (though more warmth-loving) Savannah Sparrow, the latter has crisper, clearer streaking and commonly shows yellow in the stripe above the eye. The Vesper Sparrow, meanwhile, wields a stubbier tail edged with white and a striking white eye-ring. The Lincoln’s Sparrow bears an even closer resemblance, but tends to be smaller than the Song Sparrow with a buffy hue to the breast (as can – heads up – a juvenile Song). The Song Sparrow is found year-round in the Lower Midwest, much of the Mid-Atlantic and southern New England, and most of the West, as well as the coast of British Columbia and southern Alaska out to the Aleutian Islands. It is a winter inhabitant of the central and southern U.S. and breeds in the Northern Plains, the Upper Midwest, and about the southern two-thirds of Canada. Interestingly, there is a disjunct resident population of Song Sparrows on the Mexican Altiplano as well, hundreds of miles south of the primary range. Song Sparrows aren’t very choosy when it comes to habitat. They tend to show a preference for brush, thickets, hedgerows, tall swards, and the like, particularly those near water, but seek out desirable microhabitats in biomes as diverse as desert scrub and the dense, dark, and dripping temperate rainforest of the Northwest. They’re commonly seen in marshes, chaparral, oldfield and pasture shrubs, farmland hedgerows, and the edge zones of woodlands and forests, plus suburban mosaics. Song Sparrows also have a fairly catholic diet, foraging for seeds and fruit whenever they’re available and consuming large quantities of insects, spiders, and other arthropods in the warmer months. In salt marshes and other coastal settings, they’re known to prey on such estuarine invertebrates as snails and brindle worms. The pleasant song of the Song Sparrow typically begins with a few short chirps, builds to a trill, then wraps up with a few more chirps or buzzes for good measure. There’s a lot of variation in pattern and tempo, though, and males learn new phrases: a capacity for flexibility and memory that seems to recommend them to females. The classic Song Sparrow call is a short, sharp chip or chirp. You can hear the Song Sparrow call here. Males stake out compact nesting territories that, in prime habitat, can translate to high Song Sparrow breeding densities. The male announces territory and draws the eye (and ear) of potential mates with busy singing as well as short flutters; in courtship, both male and female may fly together with upraised tails. On the whole, Song Sparrows are monogamous, but a minority of birds engage in infidelities. Males and females select a nest site together, usually tucked amid vegetation on the ground or in low stems or twigs; in riparian or wetland areas, the nests may overhang water. A Song Sparrow nest is a straightforward cup constructed of leaves, grass, and/or bark with an inner lining of soft grass, fur, and rootlets. The female lays several eggs, sometimes as many as six, which she incubates for 12 to 15 days. The mated pair work together to feed the young, which remain in the nest for 9 to 12 days and then hang around their parents for a few weeks further. Song Sparrows may have multiple broods in a season. Cornell Lab of Ornithology. All About Birds: Song Sparrow. Girard, J. et al. “Foraging Habitat and Diet of Song Sparrows (Melospiza melodia) Nesting in Farmland: a Stable Isotope Approach.” Canadian Journal of Zoology. 90 (2012): 1339-1350. National Audubon Society. Guide to North American Birds: Song Sparrow. Pomeroy, L.R. and R.G. Wiegert. 1981. The Ecology of a Salt Marsh. Springer-Verlag New York Inc.
Hey Buddy!, I found this information for you: "The Song Sparrow". 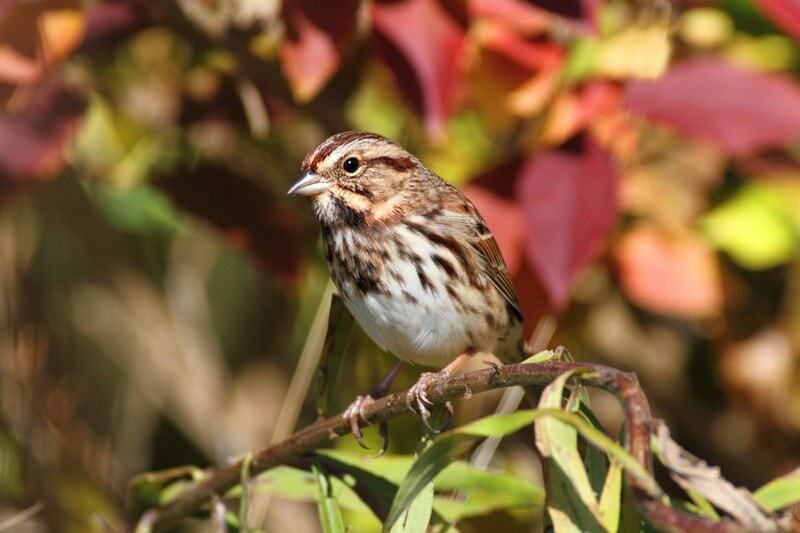 Here is the website link: http://backyardbirdingblog.com/song-sparrow/. Thank you.